New Girl hasn’t aired enough episodes for the rise of Schmidt to qualify as an example of the Kramer Effect, but his journey toward breakout status certainly mirrors that of Jerry Seinfeld’s eccentric neighbor. In the case of Kramer and Schmidt, both are secondary leads on shows built around a main character with a pre-established persona. The fact that we already know something about Jerry and Jess (based on the people playing them) going into Seinfeld and New Girl makes us eager to learn more about the wacky characters that populate their universe. From “The Seinfeld Chronicles,” no one would have guessed campus poster stores would one day stay in business thanks in part to the guy originally known as “Kessler”; in The A.V. Club’s Crosstalk-style review of the New Girl pilot, I singled out Schmidt for his idiosyncrasies, but predicted those habits would only grate as the season wore on. Fourteen episodes on, however, the New Girl writing staff has learned to effectively harness Schmidt’s “deal” while actor Max Greenfield grows into the role of a control freak with an insufferable knowledge of men’s fashions and fine dining. Greenfield has proved the most competent and confident comedic performer in the show’s ensemble, an actor who’s utterly committed to his character’s pomposity. Take, for instance, the gravity he lends a line like “I can get a tetanus shot, but I can’t fix damaged suede.” Not a great line on its own, but Greenfield’s obvious belief in the integrity of his character’s worldview sells it. “Control” is the stuff of tried-and-true sitcom formula, replete with predictable beats and admonishments from Nick and Winston that Jess is messing with the delicate ecosystem of the loft—but it also represents further baby steps toward the series’ ability to tell full, self-contained stories. So much of New Girl’s early goings were formless half-hours, so it’s great to watch the series trot out an episode that has a tangible beginning, middle, and end. And if it needed to nail down its characters before moving on to the trickier task of mastering storytelling, so be it. With Jess and Schmidt (and, increasingly, Nick, Winston, and Cece) established as three-dimensional people with wants, needs, and opinions on whether Tahitian vanilla and standard-issue vanilla can inhabit the same spice rack (Schmidt: No; Jess: Yes, and they should also enact one-act plays where they’re star-crossed lovers and Tahitian vanilla knows the vital information about its country of origin), you can look past the trite beats thanks to enjoyable character dynamics. Similarly, the 14th episode of the season is too late for a “Jess’ meddles with dynamics in the loft” A-plot, but the way that meddling temporarily alters her relationship with Schmidt and disrupts Nick and Winston’s routine to the point that they’re slap-fighting in the grocery-store checkout line, you can totally forgive the writers for returning to that well. In the end, “Control” is really about the crucial roles each roommate plays in the loft’s surrogate family; push someone out of their role and neglect to fill it and things can change from bad to worse. Remember that “control” can refer to power, restraint, and the standard of comparison in an experiment. 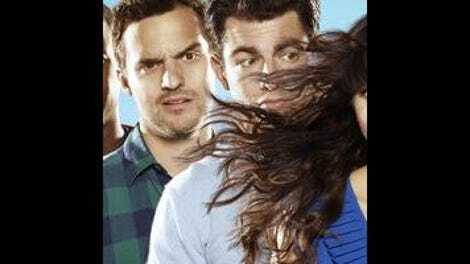 “Control” obviously concerns a scenario that’s part of the experimental group in New Girl’s research into its various character dynamics, but it’d be nothing without the control examples established in previous episodes. It’s unfair that so much of the order within the loft rests on Schmidt’s shoulders—but he’s happiest that way, as are his roommates. In the ongoing definition of New Girl’s breakout character, that’s an important aspect to remember. Nick and Winston’s escalating fight over Nick’s poker debt (and all other forms of debts, including emotional and personal ones) is an organic way to generate conflict between the two longtime friends, but it’s hard to believe Nick wouldn’t clear $200 in tips in his next few nights of bartending. Either the clientele of that posh-looking bar where he works is super-cheap, or all of Nick’s tip money is going toward the 400-plus free cognac and Cokes he’s served Winston.